If you want your data to be safely stored in a separate device, choose the PNY Turbo Flash Drive. This flash drive comes with 256GB of memory for storing all your downloads, multimedia files and other digital data in one place. Its USB 3.0 interface ensures fast transfer along with backward compatibility to older versions. 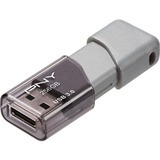 Order the PNY Turbo Flash Drive now!